← Come on in, 2015! First news of 2015 – happy to announce I’m a Certified Stress Management Coach! 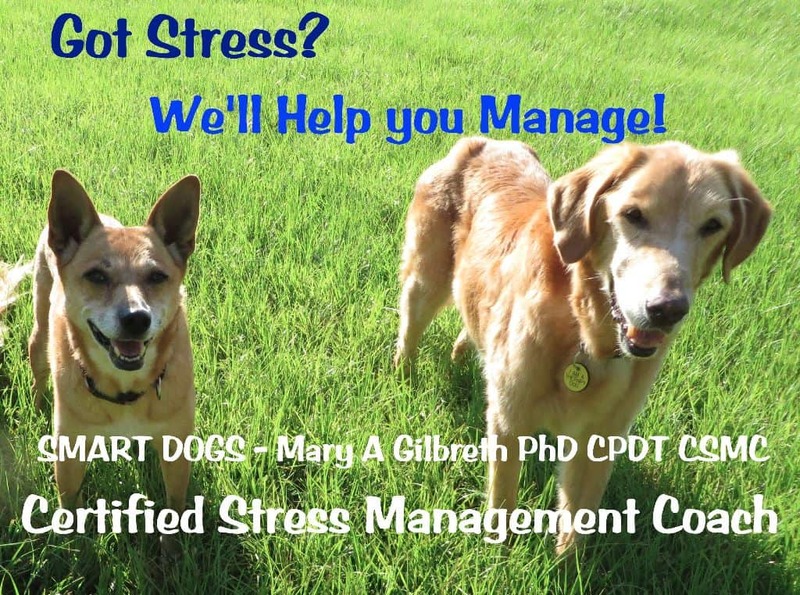 Helping people manage the stress in their lives has always been crucial in my work at SMART DOGS. Why? Stress affects all of us – for better and for worse! Stress affects learning & behavior – for better and for worse! Mismanaged stress feeds undesired behavior and decreases wellness in dogs and in people. Stress from the human end of the leash causes stress at canine end of the leash. Stress from the human end of the leash affects progress at both ends of the leash. As for the “connection” we desire to share with our dogs, stress affects that, too. Our stress coping skills affect the health of all our relationships. Whether it’s house-training, sit-stay, leash skills, dog sports, or behavior modification, stress will make or break the deal. Your response to stress will move you & your dog forward or hold you back, enable your progress or hinder it. This applies to all areas of life, dog-related or not. Healthy stress management is at the core of the program I’ve developed called Life in the SMART Zone. It’s the first of three key principles. Emphasis on dogs but people are most certainly included. This principle teaches topics such as nutrition, communication, physical & mental enrichment, learning, behavior & habits, energy, emotional states, effects of stress on body and mind, connection & relationships. Many important topics in this principle and all of them relate to stress and stress management. All are important in my work helping to improve life for dogs and the people who love them. Life in the SMART Zone is more than “dog training”. It’s learning & behavior change, developing healthy behavior & habits, healthy lifestyle. My inspiration, knowledge and experience come from many sources: my previous work as a Molecular Biologist, as a Registered Patent Agent, my current work as a Certified Professional Dog Trainer, and my personal life which continues to be shaped by many a lesson from all kinds of people, dogs, uplifting experiences, and “dig deep” ones (you know the ones…painful, dark, difficult ones that present you with an opportunity to dig really deep and grow, or not). All the wonderful behavior and skills we seek to develop in our dogs, I hope we also develop in ourselves. We’re all works-in-progress as we strive for better behavior at both ends of the leash. Stress management coach is a familiar hat though I hadn’t previously called it by this name. In order to help you learn and change your behavior so we can teach your dog, I also help you manage stress. In addition to “dog training” skills, my sessions also teach time management, goal & priority setting, organizational skills, communication & relationship skills, improving self-esteem & confidence (both ends of the leash). When are these useful, you ask? “I didn’t have any time at all to train this week” or “Grrr! My puppy/dog is chewing up the house!” or “I’m ____ (pick one or more: overwhelmed, tense, terrified, nervous, frozen in fear, frustrated, angry, panicked) because my dog barks and lunges when he sees dogs and people” or “HELP! I’m having problems house-training my dog” or “I think my dog would enjoy that dog sport / activity, but I’m too ______ (pick one or more: afraid, nervous, non athletic, scared, clumsy, embarrassed) to try that“ or “My dog is stressing me out!” Inherent in my work at SMART DOGS is helping you control your stress so you and your dog can learn, grow, and share a happy, healthy life. Many wonderful skills and tools assist me in teaching people and dogs. A stand alone topic on its own. Positive reinforcement, splitting and shaping, clickers and other event markers, video (of teacher but also of student), Primary TAGteach Certification, simple catch-phrases like “too many mind”, maintaining a supportive learning environment, to name a few. Many skills and tools to improve teaching and learning and build confident students (human and canine). My “bag of tricks” contains well-loved, effective skills and tools, but I wanted to add new ones for stress management in humans. What a treat! I enjoy having more sources of inspiration and knowledge that help me grow and share with others. (By the way, look around, these sources abound if your eyes are open.) I decided to try SI and John, and enrolled in their CSMC course. I’m glad I did. I enjoyed it! The course enhanced my existing knowledge and gave me additional tools and solutions just as I was hoping. Nice! The accompanying book, “The Everything Stress Management Book” by Eve Adamson is a convenient resource and good addition to my library – perhaps to yours as well. I also learned of useful organizations like The American Institute of Stress, the National Association for Self-Esteem, and the National Sleep Foundation. On Dec 31, I passed my certification exam and welcomed the New Year as a Certified Stress Management Coach! (Certificate coming by mail, will share a pic in future.) Certifications, degrees, coursework, etc., are wonderful accomplishments, but it’s only by our unique application and sharing of the knowledge that we bring them to life. I’ll bring mine to life at SMART DOGS where I’ll keep on helping people & dogs learn, change their behavior, conquer stress, develop healthy habits, improve their quality of life, and have a great time in the process! I hope you and your dog can join us.